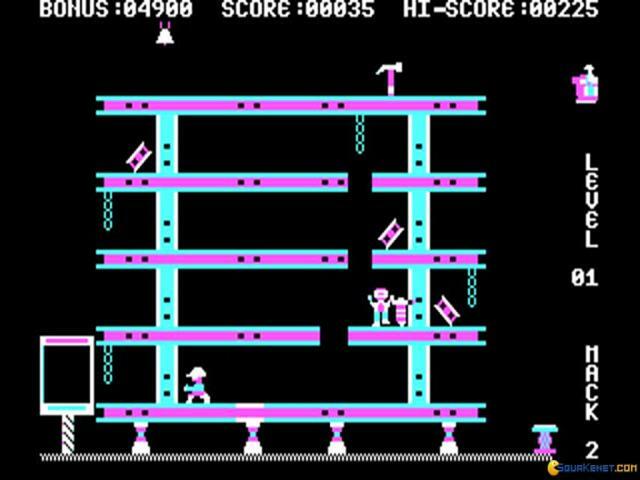 Bearing more than a passing resemblance to the likes of arcade classics Donkey Kong and Miner 2049er, Hard Hat Mack is actually a clever and inventive little platformer that is maddeningly addictive thanks to its combination of well designed levels and high level of challenge. 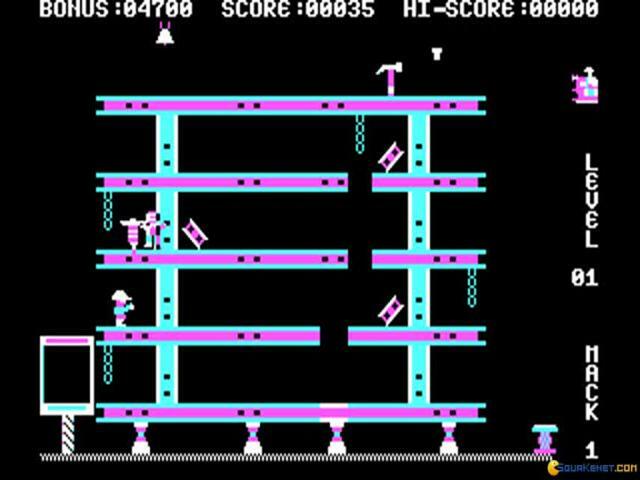 If you're unfamiliar with Donkey Kong or its ilk, this is basically a one screen platform adventure where you must achieve a certain objective before moving on to the next level. 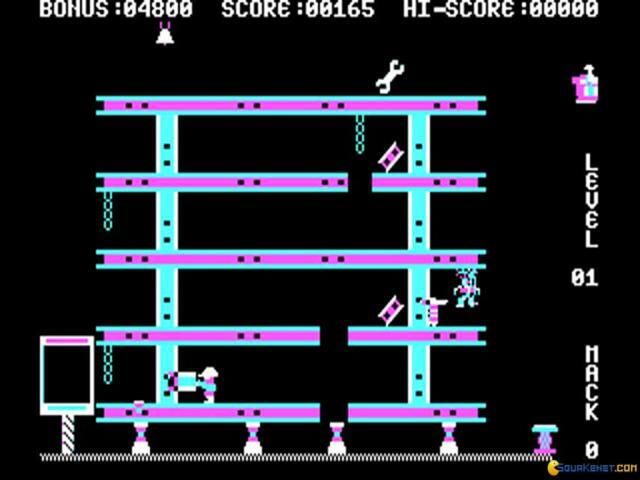 Here, as you might expect, the game is set around a construction yard where the player controls the titular builder through a series of complex levels which are made up of conveyors, spring boards, lifts and suchlike. 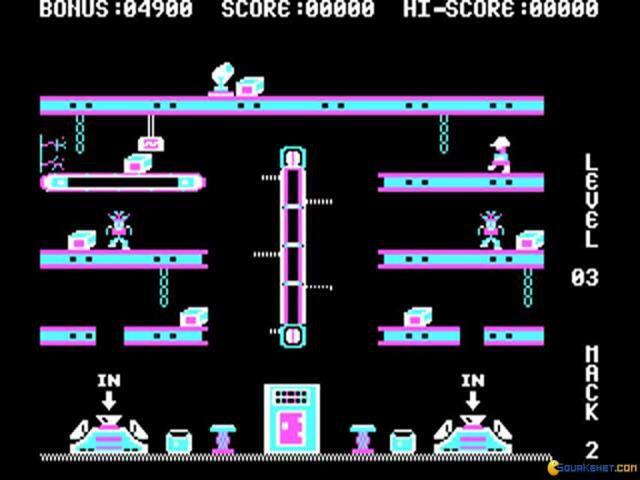 The goals vary according to the level and for example require Mack to fill in a series of gaps in the platforms, grabbing a roving jackhammer, collecting lunchboxes and dropping things into a processor. Of course, complicating matters are the rogue safety inspectors and vandals and falling bolts, contact with which will cause the loss of a life. 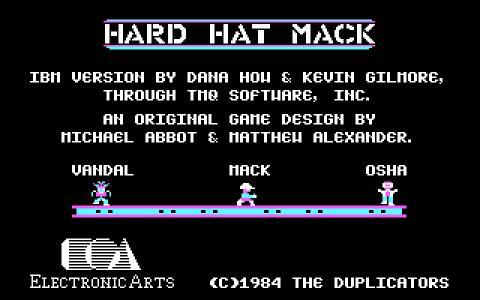 That's pretty much it to the game and although it might not sound like much, Hard Hat Mack is addictive stuff if you're into your old-school platform thrills. The levels are simply but effectively designed, with a neat variety of obstacles and challenges to face and its this variety which is perhaps the game's strongest point as each level is distinct from the last. 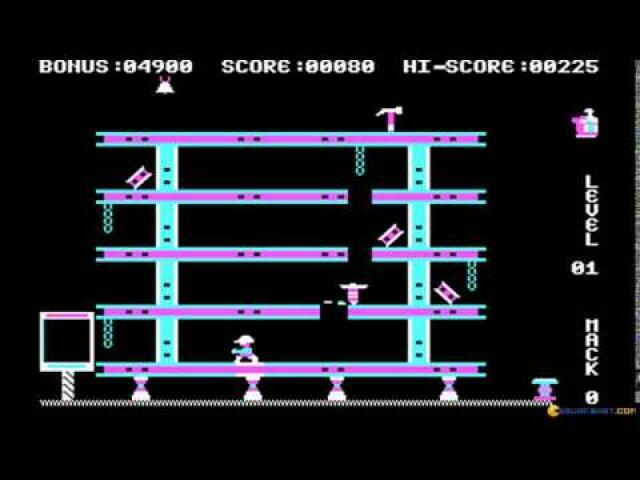 The only real problem is that there are just three levels to complete and while they are pretty difficult, even a moderately determined player will inevitably complete them after just a short while, rendering the game somewhat lacking in the long term. While it lasts though, Hard Hat Mack is fun stuff. 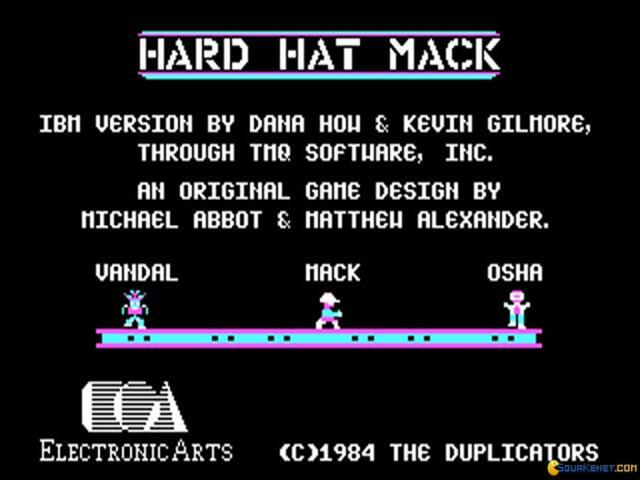 If you've ever played the Donkey Kong arcade classic, or seen it play, you will know what this Hard Hat Mack is about. You control your character's movements, left and right, and you can jump. 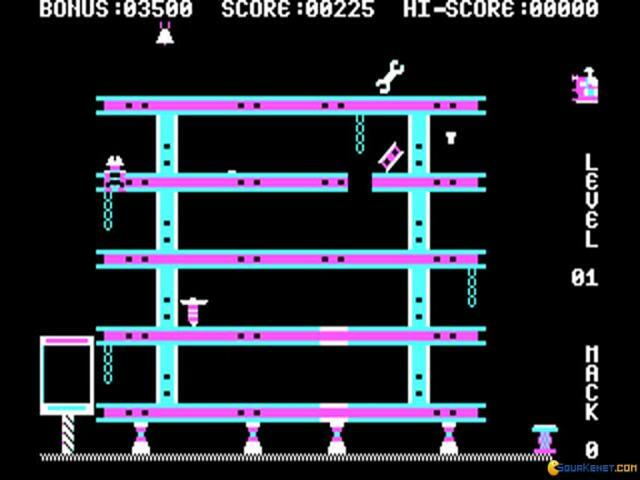 Each level will present you with a new scaffolding in a construction site, each with its own puzzle like correct approach. 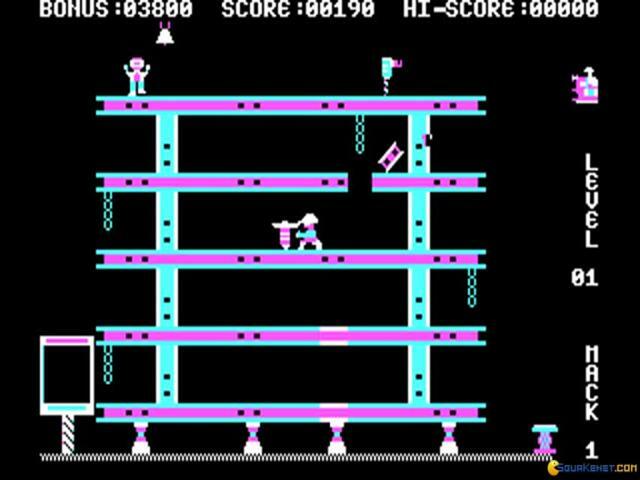 Unlike Donkey Kong, this game has a few more diverse elements. 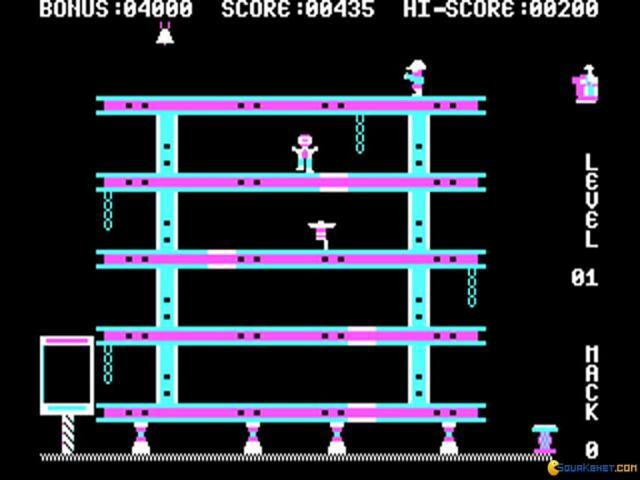 It introduces movable object, which can be used to cover gaps in the ground, it also feature areas that help you jump higher and some other such items that diversify gameplay and make play thorough more diverse. 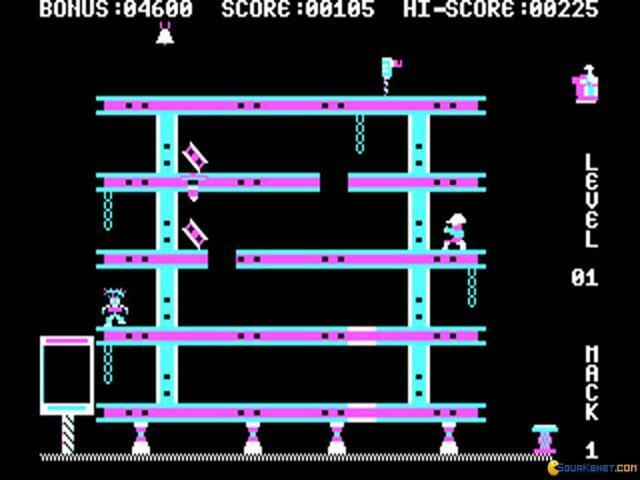 Graphically, the game is on par with the Donkey Kong brethren, with a color palette that seems a bit too violet, with very bright blues and pinks over a black background. 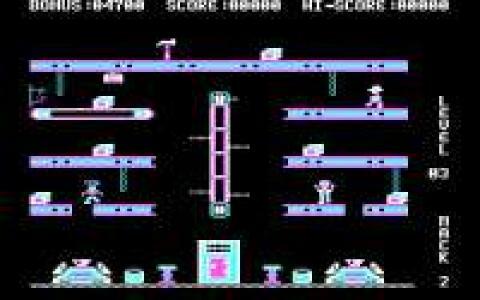 The music is minimalist but in tune with the tone of the game, so you won't mind it. 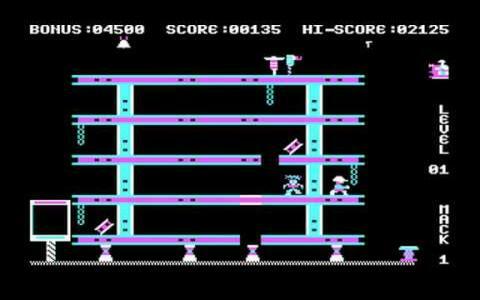 Other than that, the game has a very good number of levels, so you can play for longer periods trying to beat your score or to learn the trick of new levels.